Oh gross. 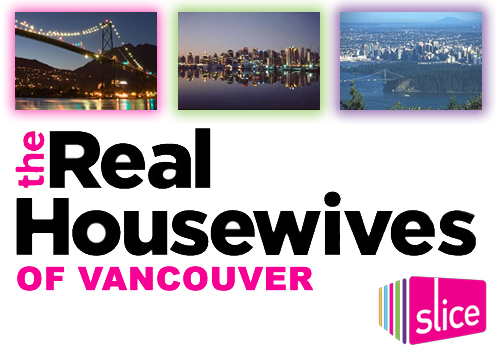 The Real Housewives franchise is coming to Canada. Originally there were whispers of it going to Toronto, which would have made sense, but the announcement has been made. The first franchise of the show in Canada will be in Vancouver. Slice, the Canadian middle aged housewives channel, will be producing the show...so expect it to be more drab than the insanity that you see in the States (more so because Canadians tend to be more sane, but also because of the network). They are still in the process of casting the show...so what we are all wondering is: Who will be on the show? Hummm, obviously their will be at least one Canuck wife on the list....especially if they bring home the cup in the next week. Maybe Michael Buble's new bride, Luisana Lopilato? Lululemon founder Chip Wilson's wife Shannon? To be honest...I am not up on my Vancouver contenders, but I am sure there are a couple good ones out there. Hopefully it will be classy with some drama...but the chances of a snoozefest are high. We shall see. I'm so facking pumped for this!! !